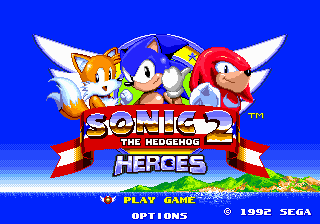 Sonic 2 Heroes is a hack of Sonic the Hedgehog 2 for the Sega Mega Drive by flamewing that allows the player to direct Sonic, Tails, and Knuckles simultaneously, similar to Sonic Heroes. It also features multiple elements from ‘’Sonic 3 & Knuckles’’ including element shields, character abilities, and game save features. announced the existence of the project once it was well underway. 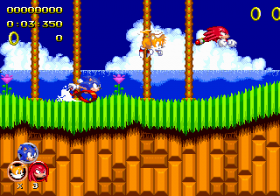 This new version, entitled Sonic Classic Heroes, supersedes Sonic 2 Heroes and saw its first release on 20 July 2012. 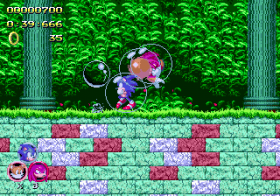 The player can choose to have one, two, or three characters—from a choice of Sonic, Tails and Knuckles—and, when using more than one, can rapidly switch between them. A new options screen enables the player to select the number of characters to play as, and the order thereof. Future versions will include multiple save slots and several other options. Up to three players can play co-operatively via the Team Player multi-tap. Special Stages can be played in this way, too; currently, all selected characters enter, but in the future this will be optional. Sonic can use the Insta-Shield and Super Peel-Out, and he has a higher top speed. 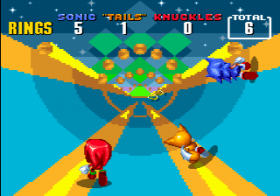 Tails can fly, swim and can carry either or both Sonic and Knuckles. Knuckles can glide and climb. Power-ups are shared between players; for example, breaking a monitor containing a shield leads to each player character receiving a shield of that type. The Blue Shield gives Sonic the Homing Attack. 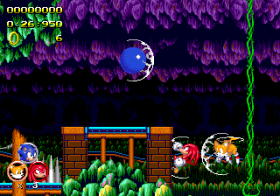 The Lightning Shield, Fire Shield and Water Shield have been ported from Sonic 3 & Knuckles and have been sprinkled through the game. Physics imported from Sonic 3 & Knuckles. 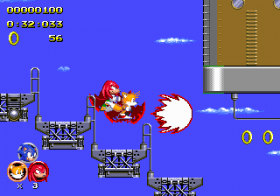 Projectiles bounce off of Tails' tails and from Knuckles when gliding, as well as from shields, as they did in Sonic 3 & Knuckles. 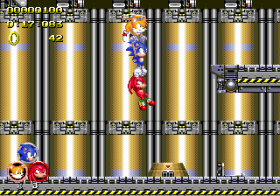 Graphics imported from Sonic 3 & Knuckles, particularly when they could be used to reduce the VRAM footprint. A new HUD frees VRAM for Knuckles. 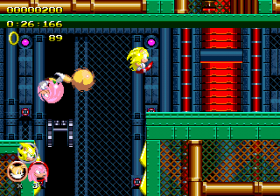 Amy Rose makes a cameo appearance flying the Tornado in Sky Chase Zone and Wing Fortress Zone, and in the pictures during the ending sequence. or (P1): Cycle through each on-screen playable character: cycles clockwise, cycles counterclockwise. or (P2 or P3): Cycle through remaining on-screen characters not being controlled by other players. All other controls and player abilities are consistent with their traditional standards in the Sonic series. Sonic being able to carry Tails and/or Knuckles while running. This page was last edited on 15 April 2018, at 13:50.